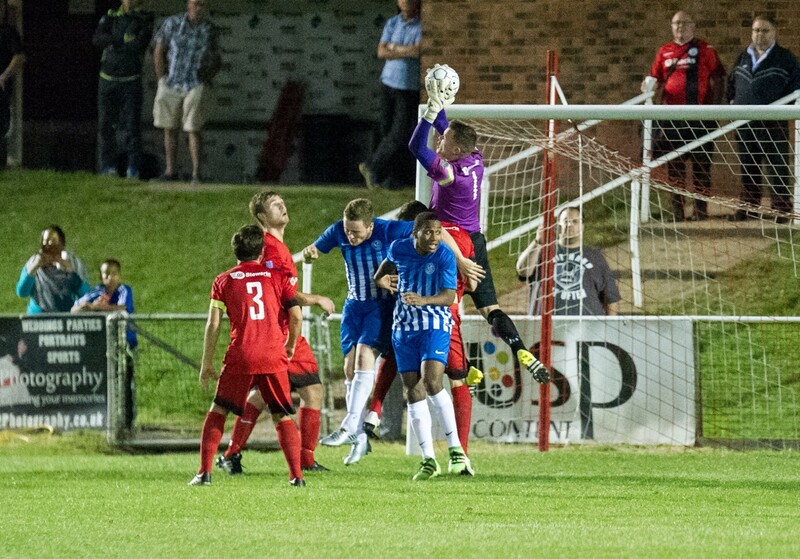 Binfield moved three points clear of Thatcham Town at the top of the Uhlsport Hellenic Premier League thanks to two goals from Liam Ferdinand in a 2-1 victory over Thatcham Town. Monday night football returned to Hill Farm Lane and a 12th goal of the season for Ferdinand gave the Moles a 1-0 half time lead from the penalty spot. Garry Aulsberry claims a cross for Binfield FC against Thatcham Town. Photo: Colin Byers. 12 minutes into the second half Ferdinand struck again to make it 2-0 and seemingly seal the points, but Gareth Thomas had other ideas pulling one back for Thatcham with five minutes left on the clock. Binfield held on though and now have a seven day break before a double header with Bracknell Town in the league and FA Vase. Thatcham Town boss Danny Robinson said on Twitter after the game “we were simply out worked by a very good side”. Main image: Liam Ferdinand penalty by Colin Byers.